I've previously mentioned my slight obsession with potions promising thicker, fuller hair. So you can imagine my delight when my hair stylist informed me this week that he found all sorts of new hair growth throughout! I could account for the added fullness around the temples, as I've been applying NeuHair (sporadically) for a few months. As for the rest of my hair, I owe any improvement to Body Mass from Kevin Murphy's Plumping Line. 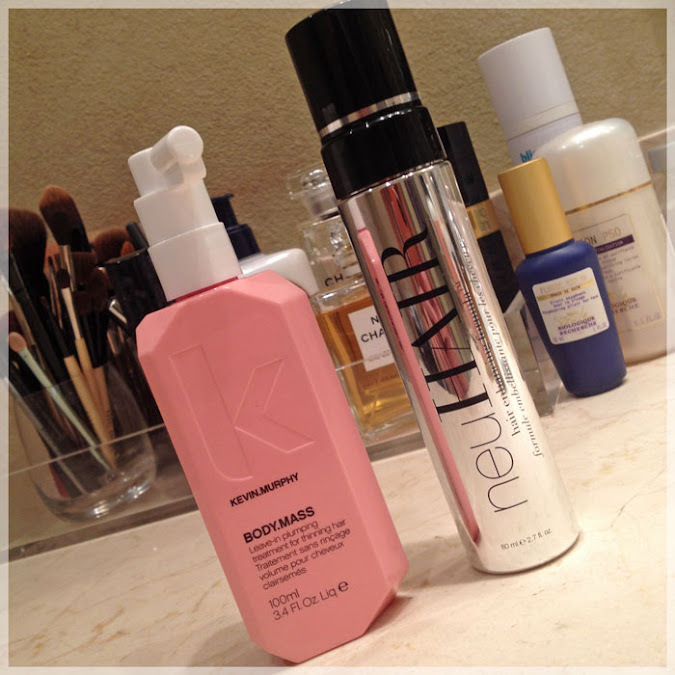 It's my new favorite volumizing spray. I've been using it for about 3 months. Turns out, Body Mass was inspired by the eyelash lenthening/thickening industry and its ingredients provide instant volume but also promote hair growth! Wishing I could sign up for monthly replenishment! Try it, you'll thank me! For more in-depth information about Body Mass, check out this article.